The Creative Audio Archive (CAA) is a Chicago based center for the preservation and investigation of innovative and experimental sonic arts and music. CAA is an initiative of the Experimental Sound Studio (ESS), a non-profit sonic arts organization founded in 1986 for the production, promotion, and preservation of innovative approaches to the sonic arts, including music in its many forms, audio art, radio art, sound poetry, sound installation, and intermedia, performative, and cinematic disciplines in which sound is a major component. CAA was formed in response to growing concerns over the general state of historical preservation of non-mainstream audio, in particular, recordings, print, and visual ephemera related to avant-garde and exploratory sound and music of the last five decades. CAA is therefore conceived as a center to safeguard volatile materials, to transfer them to accessible and stable media, to catalogue and cross-reference these materials, and to make them accessible for study and, where feasible, presentation to the public at large. CAA seeks to bring together various existing collections and, where appropriate, to keep these collections intact as autonomous "sub-archives." Currently, CAA houses the ESS Collection, the Links Hall Collection, the Sun Ra/El Saturn Collection, and the Malachi Ritscher Collection. As each archive is processed, transferred, cataloged and encoded, their respective finding aid is updated on this website. Access to the collection is open to the public by appointment. To schedule an appointment, please email: matt@ess.org. The SUN RA/EL SATURN COLLECTION consists of approximately 600 tapes dating from the 1950s-1993 that represent the work of iconoclastic composer and bandleader Sun Ra. 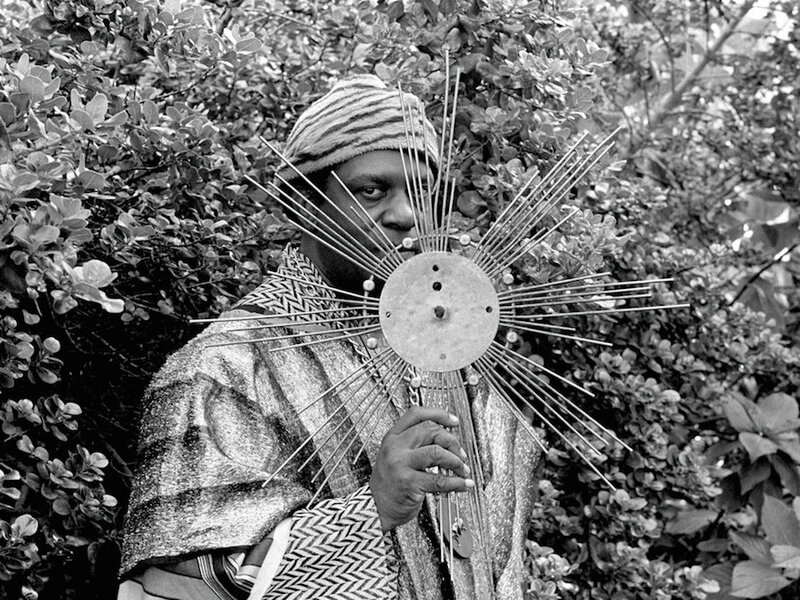 The recordings provide a unique documentation of Sun Ra's creative process, including his work with the Arkestra and its offshoots, vocal groups in Chicago, legendary trumpeter/composer Hobart Dotson, and African percussionists in New York. The collection consists of rehearsal tapes, recordings of live concerts, home recordings of sketches and experiments, and master tapes of material likely intended for commercial release. A number of tapes include lectures and recitations by Ra of original unpublished texts, which offer rare insight into his unique philosophy and a broader context for his musical ideas. Sunday Sessions from the Creative Audio Archive at ESS asks guest curators, those with ties to a particular CAA collection, to assemble a playlist around a theme and present it at a live listening event. Between and beside these historic sounds, curators will provide first-hand stories and conversation, offering further insight into important recordings of avant-garde music makers. To schedule an appointment to listen to or view contents of CAA, click the button below to send us an email. Please let us know what you're interested in investigating—cite the finding aid if you're feeling ambitious—and when you'd like to visit CAA. The MALACHI RITSCHER COLLECTION represents the work of Chicago sound recordist Malachi Ritscher. Ritscher was a passionate supporter of Chicago's improvised music jazz scene. Although technically an amateur, Mr. Ritscher was well known in Chicago for making meticulous, high fidelity recordings at hundreds of live music events from the mid-1980s (perhaps earlier) until his death in 2006. This collection of recordings, now a part of the Creative Audio Archive, is a unique record of musical development in Chicago during a particularly fertile period, a history that resonates to the present. Read Marc Fischer's pamphlet on Ritscher's life, activism, and work, written on the occasion of Public Collectors' exhibit about Ritscher at the 2014 Whitney Biennial. These include audio art, music, radio art, installation, sound poetry, cinema, performing arts, and other projects. The collection does not include works created by clients or members who used ESS facilities. Sound recordings that comprise the collection were recorded and collected by staff. As an organizational archive, the collection will continue to grow as new programs are documented and archived.. This collection consists mainly of CDs and liner notes. Liner notes include labels, dates, record labels, description, and artist instrumentation. CDs included are those of varying musical arrangements and a diverse assortment instruments and musicians. Also in The (a)R(t) Noise / Necessary Arts Collection box is the “Sound Recording Gift Agreement," liner notes for the CDs, some photocopied news clippings, information concerning the music included in this box, and two vinyl records labeled “Object Lessons." The Sun Ra/ El Saturn archive contains over 700 hours of recorded material left behind by Sun Ra and his Chicago-based manager Alton Abraham. Damon Locks and Terri Kapsalis were commissioned by Experimental Sound Studio to create pieces in response to this archive. In lieu of solo work, they teamed up and invited The Eternals' Wayne Montana to work with them to make a sound piece. They then welcomed animator Rob Shaw to create an accompanying visual track. "Noon Moons" is the result of their collaboration.